YouTube / Team CocoComedian Nicole Byer tells her story to Conan O’Brien. 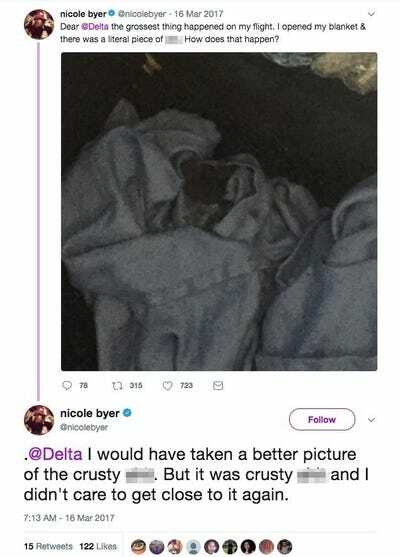 Comedian Nicole Byer said she found poop on her in-flight blanket while flying first-class on Delta Air Lines. She said Delta told her it may have come from a disgruntled employee. Byer said she received 600 Delta Dollars, 50,000 miles, and a refund on her ticket after reporting the incident to the airline. Airlines put blankets in sealed, plastic bags to make it appear as if the blanket is new – or, at least, has been washed since its last use. But comedian Nicole Byer found out the hard way that isn’t always true. During a recent appearance on “Conan,” Byer told a story about a Delta Air Lines flight on which she allegedly found poop on her in-flight blanket. 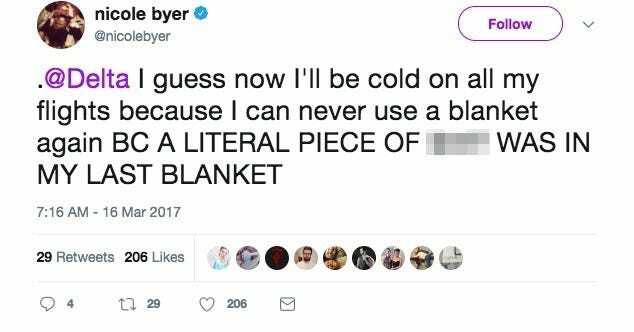 Byer tweeted about the incident in March 2017. 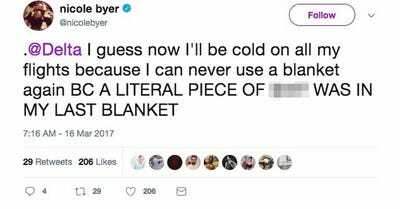 Byer was flying first-class from Louisiana to Atlanta, when, during the descent, she became cold and unwrapped the blanket. “I pulled out the blanket out of this sealed, plastic bag. Open it. A little brown crumble falls on me,” she said. After the flight landed, Byer said she told a flight attendant about the incident and asked for hand sanitizer. After the flight attendant inspected Byer’s blanket, Byer said the attendant became excited. “Oh my god, I got to get my phone!” the flight attendant reportedly said. Byer then said she negotiated Delta’s initial offer of 250 Delta Dollars to 600 Delta Dollars, 50,000 miles, and a refund on her ticket. But her troubles weren’t over. “I found a piece of poop in my phone a week later,” she said.